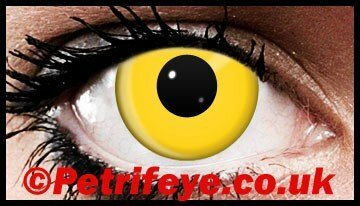 For a look all your own and one that will make a forever impression the Solid Yellow Block Contact Lenses are sure to get you to that point. The lenses are, very simply, all yellow in colour with the black of your pupil really helping the golden yellow to stand out. Whether for a night on the town, or just to be something a little different, these lenses are a crowd pleaser.